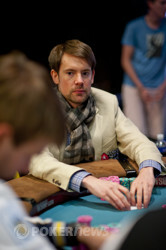 Danzer scooped two huge Stud-8 pots to rocket into the chip lead, and Chad’s stack began slipping. It was Tim Burt who busted first at the official final table though, when Danny Ratigan had a seventy-six low and three hearts in Stud-8. Sixth and seventh street both brought hearts for Ratigan, giving him a flush and eliminating Burt in eighth place. Wing Wong followed him out the door next, busting in an Omaha-8 hand against Danzer. 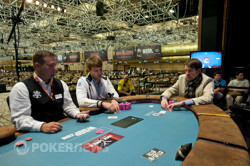 The remaining six players then went on a dinner break, and when we returned, Chad was the next to go. He was unable to get anything going at the final table, and slid down the counts until he was the shortest stack at the table. He became so desperate, that at one point he tried to use a fortune cookie to help with his decision-making. On his final hand, Chad not only committed the rest of his chips, he reached for his wallet and tossed both his Visa credit card and his AAA card onto the felt. It’s a good thing they really weren’t at risk, because Gregorich busted him in sixth place. Yuval Bronshtein was relegated to the short stack when Chad busted. He tried to make a comeback, doubling through Kovalchuk in a hand of Stud-8 right after Chad was eliminated, but he couldn’t string together multiple pots. Bronshtein committed the remainder of his chips with a pair of queens in Stud-8, and Ratigan had him at risk with a monster draw. Ratigan made a straight and a low on sixth street, and held as Bronshtein bricked on seventh, eliminating him in fifth place. Kovalchuk’s was a slight favorite over Danzer’s , and the flop kept him in the lead. The on the turn left Danzer with just four outs to a straight, and the bricked on the river. Kovalchuk’s supporters mobbed him when it was all over, grabbing him, and tossing him into the air several times. 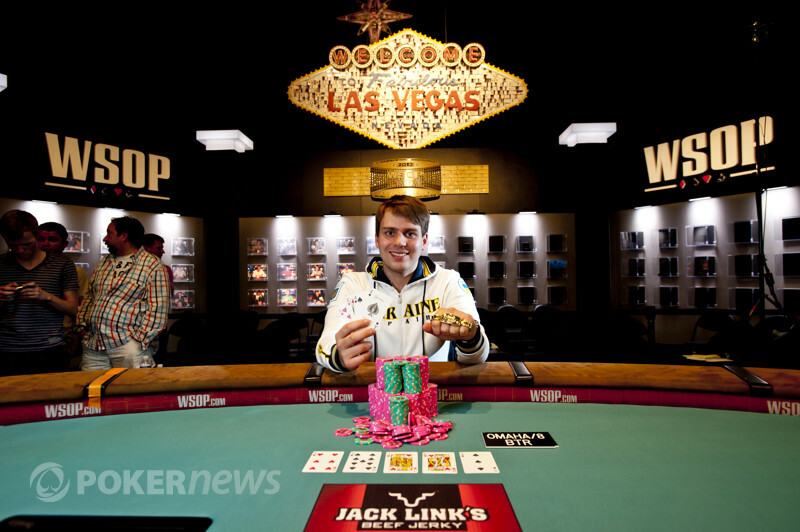 The 22-year old Ukranian native is now a two-time bracelet winner – he won the $2,500 No-Limit Hold’em Six Handed event last year, earning him $689,739. Congratulations to Kovalchuk on winning number two, and thank you for joining us during these last three days of grueling poker. 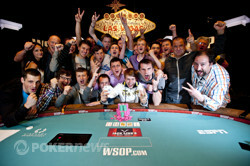 Be sure to stay tuned to PokerNews.com for all of your up-to-the-minute updates from the 2012 WSOP. 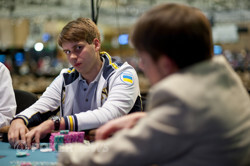 The 22 year old Ukranian defeats Germany's George Danzer for his second bracelet.